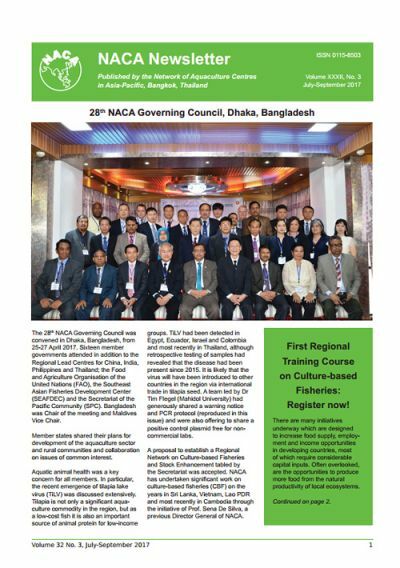 28th NACA Governing Council, Dhaka, Bangladesh. First Regional Training Course on Culture-based Fisheries: Register now! 11th Indian Fisheries and Aquaculture Forum, Kochi, 21-24 November. Audio recordings for regional feed consultation now available. 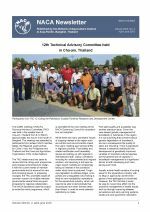 Disease advisory: Tilapia lake virus - an emerging threat to farmed tilapia in the Asia-Pacific region. Fact sheet: Tilapia lake virus (TiLV): What to know and do? Urgent update on possible worldwide spread of tilapia lake virus. Tilapia lake virus - a novel Orthomyxo-like virus. Quarterly Aquatic Animal Disease Report, January-March 2017. Proceedings of the International Symposium on Aquatic Animal Health and Epidemiology for Sustainable Asian Aquaculture. ICAR-CIBA launch "Vanami Shrimpapp", a mobile app on Pacific white shrimp (Penaeus vannamei) farming. Pakistan officials train on aquaculture certification.